Gordon poked the dead bird with a piece of driftwood. I stood opposite him in my wet suit leaning on my surfboard. The gull was an albatross, larger than a seagull. Finding the big bird dead on our beach was unusual and, I suppose, interesting. ‘Albatrosses don’t just fall out of the sky,’ I said, as Gordon gave the bird a tentative prod with the twisted stick. Gordon had been out for his morning walk before opening up his café across the road from the beach. ‘Yes, and you can see how its wing is broken,’ he said. I leaned down and turned the big bird over. It tumbled awkwardly from one side to the other, its grey and white feathers dull and covered in the sand. Lying there on its back, one huge wing outstretched and the other at an L-shape, the albatross almost looked surprised at its fate. ‘It’s against the law to kill albatrosses, isn’t it?’ I asked. Gordon stood back and threw the stick into a streak of white water creeping up the beach. ‘I’d better go and open up,’ he said, turning to walk up to the dunes. The broken bird came to mind again when another albatross landed near where I was sitting on my board in the surf. The onshore wind made the surf rough and difficult to ride. I liked it like that. Nobody else out, tough conditions and the occasional stand-up wave. Once I fought my way out through the grey storm surf I could turn around out the back and look in at the chaos as wave after wave crashed in no particular pattern. Patience. Don’t let the thunder of energy crashing down the beach push you into taking off early and ending up in that dishwasher. So I was sitting out there alone, waiting for the wind to lessen and a set to form up into some kind of shape, when the albatross dropped into the water nearby. It was alone, most seagulls having flown inland or dotted along the white wet sand of the beach, huddled facing into the wind. Seeing that albatross could have been interpreted as some sort of omen, if I was into that sort of thing. Now looking at this big bird floating nearby, I was reminded how ugly the other bird had seemed on land and in death and yet how confident the albatross seemed sitting next to me in the storm waves. I must seem the ugly one out here and the one most at risk from a flip of the waves. The bird suddenly unleashed its wings and ran across the surface of the water before taking off. Alerted, I looked around and saw the sea changing shape as the wind had now died and waves formed into a set behind me. The first two waves passed as I paddled hard to get over them, and I could see the last waves were going to close out in a line across the bay, so I turned and grabbed the third wave. Really, there wasn’t much of a face but it was enough to get up good speed before the wave broke, engulfing me as I fell flat to hang on the board for the ride in. A small flight and quite insignificant compared to the albatross. ‘Bill, your father called. He’s been trying to reach you urgently. Called you on your phone but…’ and shrugged. We walked up through the sandhills to the roadside and Angelique crossed over to Gordon’s Seaside Store and Café. I threw my board in the back of my car, got out of my wet suit and changed in the shelter of the boot door as the rain eased. ‘Urgent’, everything was urgent for dad. 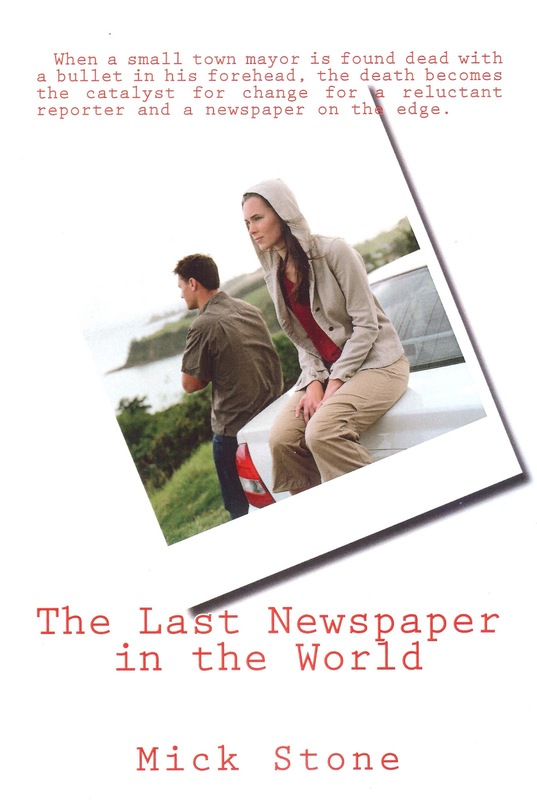 He owned The Coast Courier, or as he liked to call it ‘The Last Newspaper in the World’. Of course it wasn’t the last newspaper in the world, although it felt like that to him as more and more local newspapers were merged into national newspapers, which themselves dissolved into media groups. Sometimes it did look like dad was the last independent newspaper owner, if not in the world at least in our niche as his contemporaries disappeared from the scene. I had tried to persuade the old man to get out of the business or at least go digital with The Coast Courier. Dad would pop another peppermint – he was constantly trying to give up smoking – and look at me as though there was something important I didn’t understand. He’d recently added the last newspaper in the world slug line to the masthead, as if to underline his belief. During summer, the fields around Waterslea shimmered. Maize crops were the mainstay for farmers in the area. As the summer’s heat grew more intense, the crop was transformed into fields of gold. Today, however, it was mid-winter and the fields were in stubble, a kind of lifeless grey. Waterslea had once been a swamp and although drains now ran out to the river, the area was still prone to flooding as nature once again tried to regain what it had lost. The police had a roadblock up and I pulled over onto the edge of the road, careful not to get too close to the drain. I got out of the car, silently swearing as I saw the group of cops. The sergeant was Norm Stead. He had a face resembling a hammer and probably was at times. His muscular body could be taken for that of a body builder but it was all natural – he’d always been a big prick. Standing next to him was Timi Tatua. I’d been at school with Timi and we gave each other the nod. ‘Took your time,’ Stead said. He had a surprisingly high voice for such a big man. ‘Bill, you need us more than we need you right now,’ Timi said. We backed off and Stead gave me a look, with a kind of smile that even now I wonder if I should have paid more attention to at the time. Remembering Harry’s urging, I got down to business.